IHG has a new weekend breaks offer for stays at participating hotels in Andorra, Belgium, Denmark, Germany, Italy, Netherlands, Spain and United Kingdom between now and January 31, 2015, that is booked by December 31. You can get 30% off stays at participating Crowne Plaza, Indigo, Holiday Inn and Holiday Inn Express hotels. The discount at participating InterContinental hotels is 20% but includes breakfast. 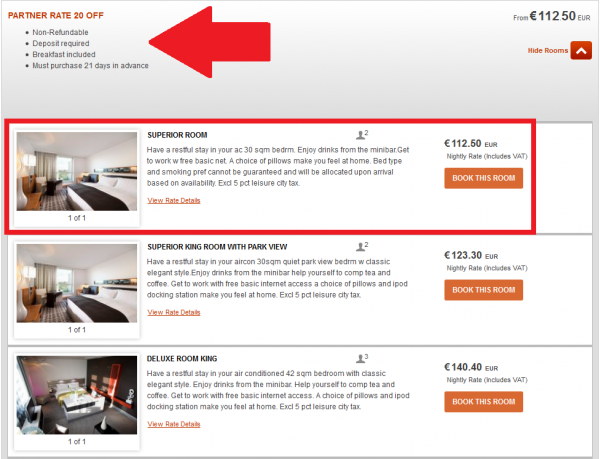 You can access the 30% off booking link here and the InterContinental 20% off booking link here. Note that you must select the 30% OFF PARTNER RATE or 20% OFF PARTNER RATE from the drop-down menu to bring up these discounted rates. You must book this rate minimum of 21 days in advance and it is prepaid & non-refundable. The hotel had other discounted rates available as well, but this 30% off partner rate was the lowest. There is another advance purchase rate available that doesn’t include breakfast. When I was checking the rates under this offer, I found out that the participation was somewhat limited. It might take some time to find a hotel where this discount applies, but worth checking especially when there are no other discounted rates available. Offers applicable for reservations made by 31st December 2014, for hotel stays in the period 1st January 2014 to 31st January 2015. Promoter: InterContinental Hotels Group Service Company, Broadwater Park, Denham, Buckingham, UB9 5HR, England (company number 00575108) (“IHG”). InterContinental 20% off represents a minimum of 20% off saving against our Best Flexible rate per room, per night for two adults sharing a standard double/twin room (inclusive of VAT). Reservation includes room and breakfast for up to 2 guests staying. Offer only available at participating InterContinental hotels brand in Europe. Stays are available for on Friday, Saturday and Sunday nights only.